The 10,000 hour rule is the theory that one must put in 10,000 hours of practice to master most complicated skills. I have seen the rule applied to soccer, golf, hockey, and of course music – all you have to do is practice 20 hours a week for 10 years, and you are set. The Beatles got their 10,000 hours in by performing over 1200 eight-hour sets in Hamburg between 1960 and 1964, and came back as seasoned performers. They were not an overnight sensation. Well, 10,000 Hours also happens to be the title of Cameo Blues’ new album. This is their second album, but don’t let the size of their catalog trick you into thinking these are a bunch of newcomers, because this Toronto-based band has been around in one form or another since 1978. If these guys haven’t gotten their 10,000 hours in yet, they must be pretty close because they sure do sound tight. Cameo Blues is made up of John Dickie on lead vocals and harmonica, Mike Sloski on drums, Ray Harrison on the keys, John Bride on guitars, and Tom Griffiths holding down the bottom on bass. They collected 11 tunes for this album: seven originals by Mr. Dickie and his buddies in the band, and four well-known covers. They arranged the album so that all of the originals are up front, and the covers are the last four tracks. Cameo Blues wisely chose to kick the album off with “Penguin Walk,” a rock and roll boogie that showcases Texas guitar tone, some nice organ work and a driving bass line. The lyrics are smart and the music is well-suited to the band, setting a high bar for the listeners’ expectations. The title track comes up next, and the pace does not let up as Dickie’s distorted voice tears into “10,000 Hours.” Sloski does some very tasteful and appropriate drum work on this tune, and its message should make this song required listening for every new band that hopes for overnight fame and fortune. The mood lightens up a little with the clever lyrics of “21st Century Rockit 88,” which is a piano-driven bluesy rock number with plenty of slide guitar. Harrison does a fabulous job on the keyboards in addition to receiving writing credit for this track. 10,000 Hours gets some gospel-inspired Hammond B3 courtesy of Lance Anderson on “Hold Your Love,” a sweet ballad that also has some nice piano work by Harrison. Bride provides a super-smooth guitar solo in the middle too, showing he has soul as well as chops. The last original track is “Talk Radio,” which bemoans what has become of our airwaves. I miss the days when you could actually find decent music on the radio too, guys. Griffiths’ bass is plenty growly on this tune, which is a nice counterpoint to the complicated (and upfront) keyboard parts. The covers are popular tunes, but all of them are done differently than I have heard before. The first is Willie Dixon’s “Howlin’ for My Darlin’”, which has been shortened to “Howlin’.” Dickie has the perfectly seasoned voice for this straight-up Chicago blues track. Going with a theme, next up is a masterful version of Howlin’ Wolf’s “Sittin’ On Top of the World.” This song has nice interplay between Bride and Dickie, the latter on both vocals and harmonica. Perhaps the most unexpected track is the cover of Led Zeppelin’s “Rock and Roll” which has enough organ to lend a circus/horror show vibe to the proceedings, without veering too far off into Emerson Lake and Palmer territory. It is a complete departure from the original, but rocks just as hard. I will have to sneak this one into my next DJ gig. The last track on 10,000 Hours is Jimmy McGriff’s “All About My Girl,” and this hard-rocking instrumental gives everybody in the band a chance to shine one last time. This was a great choice to finish up with, and is a capper to a uniformly solid album. It is nice to find an album with 11 tracks that are all well done, with the added bonus that each of them is unique and steps out in a different direction. 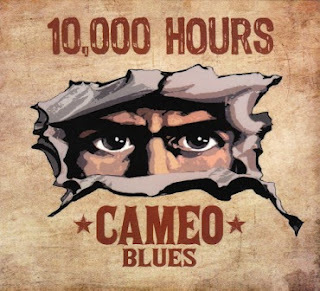 I highly recommend that you give Cameo Blues a try and add 10,000 Hours to your play list.